This document is part of DESSIN’s work package 42, the route to market. 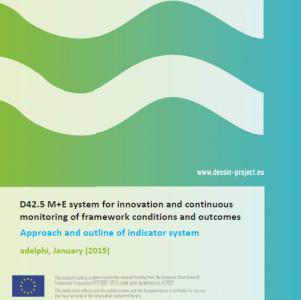 The aim of task 42.6 is to set up an indicator system to keep track both on progress and impediments of conditions for marketization of the innovative products and services demonstrated within DESSIN. This system should document the respective framework conditions as well as outcomes. In order to achieve that, an effective indicator set as well as a monitoring and evaluation (M&E) system is developed that can be used by the SMEs developing and demonstrating innovative solutions within DESSIN. The M&E system supports the entrepreneurs in identifying application opportunities for their solutions during the course of the project and also after the project ends. As the first part of milestone MS18, this document outlines the initial approach and a potential set of indicators that could be used. The indicator system will be reviewed by month 25 and finalized by month 48.